Clinton’s no friend of the earth, but she can be pressured. Trump, on the other hand, would be an ecological and moral disaster. It’s an odd feeling to be working for the election of someone you know dislikes you and your colleagues. I’ve spent a good chunk of this month trying to register voters on campuses in Pennsylvania and Ohio—registering them to vote against Donald Trump, which means pushing for the election of Hillary Clinton. It wasn’t how I wanted to spend the fall—I’d much rather have been campaigning for Bernie Sanders. The good news is that when Clinton wins, none of us will be under the slightest illusion about who she is. Truth be told, these aren’t revelations. All of us working on climate issues have known this is how Clinton feels; she set up a whole wing of the State Department devoted to spreading fracking around the world. She’d favored the Keystone Pipeline from the start, and it was abundantly clear that only Sanders’s unexpected success in the primaries convinced her she’d have to change. 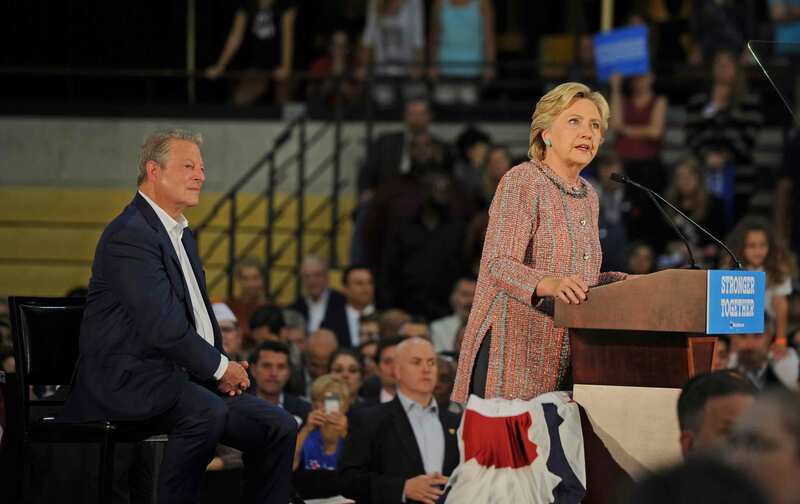 (And it was only his refusal to endorse her until after the platform was agreed upon that made the platform into the fairly progressive document that it is, on climate and other issues). Still, it stings to see in black and white exactly how little regard she has for people fighting pipelines, frack wells, coal ports. Though truth be told, that was no huge surprise either: Politicians are forever saying they want people engaged in the political process, but most of them really just want people to vote and then go home. So why are many of us out there working to beat Trump and elect her? Because Trump is truly a horror. He’s man who looks at fourth-grade girls and imagines that he’ll be dating them in ten years. He’s a racist. He knows next to nothing and lacks the intellectual curiosity to find out more. He’s a bully. He’s almost a cartoonish villain: If a writer invented a character this evil, no one would believe them. But he’s very nearly president. Because environmentalists are not just concerned about the climate—we have allies and friends whom we support. And on some of those issues Clinton actually seems sincere: She clearly cares about women’s issues and understands that we are a nation of immigrants. Because if Trump wins, we backslide on the small gains we’ve made. We’ve forced Clinton to say through gritted teeth that she opposes Keystone, for instance. She can’t, I think, go back on that. Trump has made it clear he’ll permit that and every other pipeline, just as soon as he’s done tearing up the Paris climate accord. But none of that makes it easy to go out and support her. We’ve watched all fall as she’s maintained a studied silence about the most dramatic and important fossil-fuel fight of the moment, the Dakota Access Pipeline. Even the sight of attack dogs being used on peaceful Native American protesters didn’t move her to break ranks with her industry allies and that fraction of the labor movement that still wants to build pipelines. That’s craven on her part, pure and simple. And so the good news is that when she wins, none of us will be under the slightest illusion about who she is. The honeymoon won’t last 10 minutes; on November 9 we’ll be organizing for science and human rights and against the timid incrementalism that marks her approach. It’s clear that we need to beat the creepy perv she’s running against. It’s also clear that we then need to press harder than ever for real progress on the biggest crisis the world has ever faced. “Get a life”? We’ve got a planet, just one.